Who’s the real victim here? A tense and gripping exploration of cyberbullying and teen suicide. Late at night Tori receives a random phone call. It’s a wrong number. But the caller seems to want to talk, so she stays on the line. He asks for a single thing—one reason not to kill himself. With the clock ticking, Tori has little time to save a stranger—and maybe redeem herself—leading to a startling conclusion that changes everything. 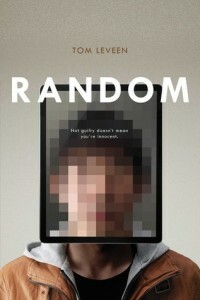 Tom Leveen is the author of Random, Sick, manicpixiedreamgirl, Party, and Zero (a YALSA Best Book of 2013). A frequent speaker at schools and conferences, Tom was previously the artistic director and co-founder of an all-ages, non-profit visual and performing venue in Scottsdale, Arizona. He is an Arizona native, where he lives with his wife and young son.